At the end of the previous Chapter we touched upon a very interesting topic. Comparison of size and historical destiny of white stone churches and pre-and post-Mongol Rus allows to make conclusions about the limits of building capacity of Russian artists, who worked in the white stone. These limits are very stable and virtually unchanged since the time of Yuri Dolgoruky until mid XV century. Remember again the approximate size of white stone churches (without pillars, apses and distortion forms), noting not only the inner space, but also the main engineering indicator of a family's cross-building - side omphalos (SEC). 11 x 11 = 121 sq.m, SEC 4.6 m.
8 x 7 = 56 sq.m, the SEC on average 3.2 m.
13 x 12 = 156 sq.m, SEC 5,6 m.
The brick buildings of Constantine in the statistics of the white-stone building, we do not include - brick has a totally different structural properties. 11 x 11 = 121 sq.m, plus 2 on the porch of 17 sq.m and 1 porch of 25 sqm, 184 sq.m, SEC 4.6 m.
29 x 25 = 725 sq.m, SEC 6.7 m.
The statistics confirm what we said in paragraph 13 of the main 3: Vsevolod the Big Nest was not trying to build temples, is considerably more than "ceilings"posed by Yuri Dolgoruky. The inner space of the SEC and the temples Vsevolod more than in Pereslavl and Kideksha, only 10-20 %. - SEC: up to 6 m.
It may seem strange that we do not enter into the definition of "maximum security" measures proportions of temples, the height of the rectangle, arches and drum, the thickness of the pillars, walls near the floor, walls with arches, etc. Yes, of course, all this should be taken into account in the calculations, although the latter would be an order of magnitude more complicated. But the problem is not the complexity and lack of information. Most of our churches we don't know the exact height or quadrangular, no dryer, no arches - in short, nothing but the two parameters that can be defined by the excavated foundations: the internal space and SEC. But to determine the extent of structural soundness enough we have these two parameters - internal space and the SEC. At about the same proportions of temples other parameters are highly correlated (or derivative) values. The assertion about the same proportions may seem controversial, but look: there is great variation in the proportions of the Vladimir-Suzdal churches in scale, may affect the reliability? The spread of this very small, and to prove this assertion, no need to resort to a geometric analysis of the drawings. In our research, we can talk much easier: we received two churches, close in size, but the "polar opposite" of proportions - Transfiguration Cathedral in Pereslavl and the Church of the Intercession on the Nerl. And since both of the temple stood for eight and a half centuries and are still, we may conclude that the effect of differences in the proportions of the reliability of the design is very small. A size that we have included in the definition of "maximum security", the reliability of the impact is significant: SEC correlates with the drum and span arches, and the internal space - and with these, and all other parameters. About the thickness of the walls and pillars, we, unfortunately, in most of our churches as we can only guess. But for all we know the buildings, except of the Intercession on the Nerl, they range from 1.2 to 1.5 m (average scatter of 15 %). In the Church of the intercession of the walls and pillars of several u (about 1 m, ie 30 %), but there, and the inner space is substantially less than in the temples Dolgoruky (more than in 2 times, i.e. by 100 %). Therefore, in the solvable problem of determining the "size limits, ensuring reliability, we have the right in most cases negligible thickness of the walls and pillars in comparison with the internal space. Cases of special designs bearing elements we will be specially stipulated. Need special consideration, such parameter as the number of pillars. Large churches in Russia (Suzdal region - the assumption Cathedral in Vladimir is the assumption in Rostov and the Nativity in Suzdal) were six pillars. But the introduction of a four-column cross-plan two additional pillars hardly had some original sacred significance (post factum, of course, can give symbolic meaning of what you want). Most likely, additional pillars were an attempt "Basilica" the building of the internal space - by increasing the length of the temples. As is known, the length of the Basilica through the introduction of new pillars could grow many times. But Russia is building the internal space was shackled Greek-cross plan. If in the Basilica on the crossing even standing drum, his load was assumed not the pillars and walls. And in the ancient temples drums were not on the walls, and on the four pillars and arches created the efforts of spreading the pillars in the horizontal plane (Fig. 16). Therefore, the role of the arc-boutants played arches aisles, and the role of buttresses - external walls of the altar apse and the arches. And when the transition from four pillars of the temple to the six pillars (Fig. 17) instead of one of the walls were two pillars, much more subject to deformation under the effect of "tipping" of efforts in the horizontal plane, structural reliability is significantly reduced. Installation of extra light drums exacerbated the problem of "tipping" loads. Fig. 16. The scheme of distribution of loading on the drum at the pillars and walls in the four pillars of the plan of the Cathedral. Fig. 17. The scheme of distribution of the load from the drum to the pillars and walls in the hypothetical transformation of the four pillars of the Cathedral in six pillars. It is seen that two additional pillars are significant "tipping" the load in the horizontal plane, and the wall behind them (much more reliable design element) almost unloaded. Fig. 18. 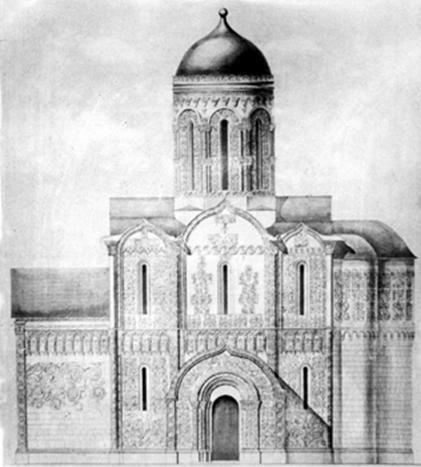 The status of the Dmitrievsky Cathedral before restoration in the mid-twentieth century (drawing AV Stoletov). Are the specific destruction of arches and pillars and walls up the difference because of their spreading out the drum. Thus, when a cross-plan increasing the number of pillars leads to the same consequences as the increase of the internal space: when the same Central chapters six pillars of the temple was less reliable than four pillars. And the introduction of additional pillars under the dome of the Byzantine tradition is not allowed. In the Basilica, where (with rare exceptions) pillars are only supported on the vaults, the increase in the number of pillars (building of the temple in length) on the strength of constructions made no difference. And when determining the reliability of the temple's cross, we see a very high correlation between the number of pillars and the inner space. We may conclude that when cross terms of the pillars is a parameter dependent on the size of the inner space. Of course, in the Church's cross can be made very small drum, minimizing the spreading the pillars in the horizontal plane and avoiding any "Basilica building. But this situation is controlled by the second parameter, we have chosen to define "maximum security" - SEC. Consequently, we may assert that for the definition of "maximum security" cross the white stone churches need to know only the size of the interior and the dome spaces. To confirm the correctness of our definition of the parameters "maximum security" (the internal space is to 200 square metersThat the SEC - up 6 m) will look at the historical fate of those white stone churches of the XII-XV centuries that this limit was exceeded. The Cathedral of the assumption of Andrey Bogolyubsky in Rostov stood there for 42 years and collapsed. Later it was rebuilt on the same plan and the previous scale, and he stood less than two hundred years. Another attempt to restore it, too, ended in failure, and in the XVI century in its place was built a brick Church. Speaking in paras. 13-14 mainly about 3 Uspensky Cathedral of Andrei Bogolyubsky of Vladimir, we have seen in the fidelity version of NN Voronin that the Church had to build up galleries for burning wood ties in the fire of 1185272. So, without a fire Cathedral stood a long time - as we shall soon see, for the white-stone architecture is characterized by very rapid decay of the wooden ties. And even if the version Voronin false communication in the fire did not burn, the need of rigging temple galleries, buttresses, 25 years after the construction is still indicative of the General unreliability of the design. Yuri Vsevolodovich, apparently, could not build a Cathedral in Suzdal smaller reasons Grand prestige - too much rush into the eyes of a constructive regression compared to the Cathedral Monomakh. Architects of the early XIII century, most likely knew about the risk of exceeding the "maximum security" and take possible measures for strengthening the Church (instead of backing used brickwork273, and high arches played the role of buttresses). But in the end the temple of Suzdal Yuri Vsevolodovich was slightly more durable than the construction of his uncle Andrew Bogolyubsky, exceeding the limit of reliability: the Cathedral for only 220 years and collapsed274. In the post-Mongolian time "ceilings" was slightly exceeded during the construction of the assumption Cathedral in Kolomna, and there is also not without catastrophe275. The Cathedral of the Chudov monastery (very likely that it exceeded the "maximum security"276), stood for 66 years and from the very dilapidated collapsed277, and collapsed so that was demolished and replaced by another temple. Naturally, in such a short time, he could not very "worn out", then, was a lack of reliability of a design. Around the same fate befell the Cathedral of the Simonov monastery (also, probably exceeding a limit of reliability), but not over 66 years, and in 72 years after construction. "Lightning" in 1476298certainly, could not by itself destroy its top: a lightning strike in crosses almost every storm. Trinity Cathedral in the Trinity-Sergius, and (though only slightly) more than "ceilings" - the building unique. N.N. 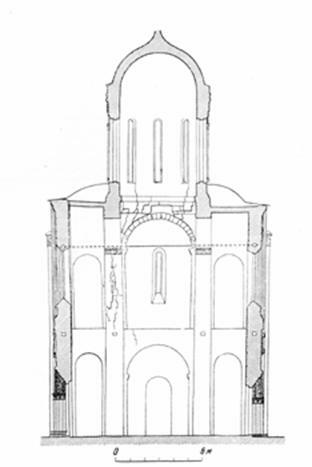 Voronin believed that the slope of the walls, pillars and arches inside (Fig. 19) had the objective to cause the viewer a sense of perspective and, consequently, greater height of the building279. But more preferable sees another explanation: the architects knew what was going on constructive risk, and built the walls, providing the most even distribution of the load. Rather, only through such engineering solution Cathedral reached our days without accidents. Fig. 19. Trinity Cathedral in the Trinity-Sergius Lavra (Wealden). Note the sloping walls, playing the role of buttresses. Size of the Saviour Cathedral in 1290 in Tver, we do not know. N.N. Voronin on the basis of old descriptions are not extant icons assumed he was seven-dome and six pillars290. But the seven-headed Cathedral - the phenomenon in the XIII century is unprecedented and, most likely, these chapters were represented iconographer arbitrarily. We, based on the absence of any accidents during the construction of the Savior Cathedral may assume that its dimensions do not exceed the "maximum security" (that is, were comparable, for example, with St. George Cathedral in Yuriev-Polsky), and he, therefore, was four pillars. The historical fate of the Cathedral is confirmed: only after 100 years it took renewing, but in an emergency condition he came after the devastating fire in 1616, i.e. through 326 years after construction281. About the size of the assumption Cathedral 1326-1327 years in Moscow, we can only guess. 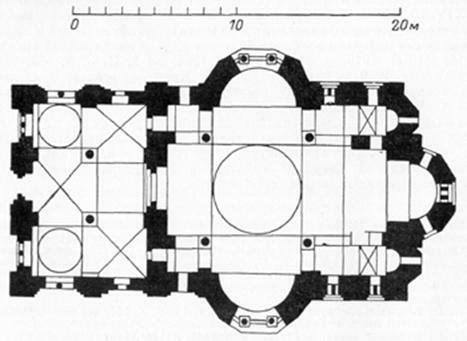 H. Wagner, pushing version of comparability dimensions of the first Moscow assumption Cathedral with built in its place Cathedral 1472-1474 years, it was recognized that the building of such a huge building during the year (August 1326 - August 1327) "extraordinary"282. We would add that such a rapid construction of another and without catastrophes - and this is not quite typical of the building, where exceeded a limit of reliability". In the beginning of XIV century, Moscow was still a small and wealthy city. In pre-Mongol Russia we have not seen a strong relation between the status of the Cathedral and its dimensions - for example, in Galicia, Przemysl, Turov, Belgorod and small southern Russian cities of St. George and Proske were diocese283but the big six cupolas of the cathedrals was not. In total, fifteen dioceses great cathedrals had six. But the relationship between the size of the city and the city's main Cathedral was straight (only a limited capacity builders - see item 6 of the main 3). Therefore, it is unlikely that Metropolitan Peter, who moved to Moscow in early 1320-s284when in the city were only wooden Church, insisted that the first285 the white-stone Church, built inexperienced Moscow builders, was comparable in size to the Vladimir and Rostov cathedrals. In addition, low reliability of the latter was already known. VP Vygolov, noting that "the desire to hyperbolicity dimensions of early Moscow cathedrals of Ivan Kalita, especially the assumption that looks obviously far-fetched and little resemblance to reality"286, gave reasons associated with economic opportunities of Moscow, and also with the fact that in the case of large sizes 1326-1327 period by the architect of the Cathedral 1472-1474 years it would not have to take as a model the "great and high Church" Vladimir assumption Cathedral287. 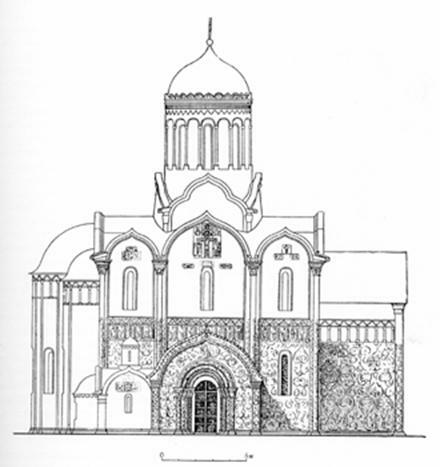 All this leads us to accept the view, K. Romanov and N. Voronin about the approximate size according to the assumption Cathedral 1326-1327 years to St. George's Cathedral in Yuryev-Polish288 (Fig. 20). Using our terminology, for example: most likely that the Church does not exceed a limit of reliability". A chronicle evidence that in the early 70-ies of the XV century the Cathedral was "backed tree"289as we will see in paragraph 12 of this Chapter, may not talk about its weak structure. Fig. 20. 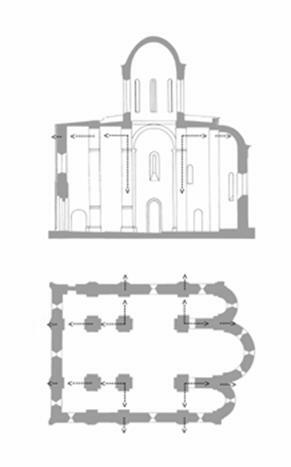 Combined plans Assumption Cathedral in Moscow (by K. Romanov). Hatching - 1326-1327 period, dashed line - the Cathedral 1472-1474 years, contour - Cathedral 1475-1479 years. However, this question remains open. The final answer will only give serious archaeological research, which in conditions of functioning of the Kremlin as a governmental residence, unfortunately, is impossible. But the construction of the new Cathedral of the years 1472-1474 is an excellent illustration of the fact that the Russian masters of the XV century and was unable to exceed the "maximum security"as defined in the Yuri Dolgoruky. Building disaster that befell this temple, regardless of the strength of the earthquake on may 20, 1474, speaks of the fundamental inability of Russian masters to build a white stone building with an inner space of about 1000 square meters and the side of the omphalos almost 7 m. Evidence few. First, strong, and even more catastrophic earthquake geologically stable Central Russia is very unlikely. Secondly, even if there was any tangible earthquake, the other temples it safely "experienced". Consequently, the assumption Cathedral was originally built with a very small margin of safety and hardly able to stand, for example, the nearest big fire. Thirdly, if the fall unfinished Cathedral was caused only by an earthquake, it is unlikely that would invite experts from Pskov, who stated low technical side of the building290. With the latter, in turn, is not so simple: Ivan III invited the masters of Pskov, the experts themselves to undertake the construction of the Cathedral, but they refused, under the very unlikely pretext291. Refer to "employment at other buildings in Moscow and the Trinity-Sergius monastery, rejecting the only honorable and lucrative offer great Prince to build the capital's Cathedral? Most likely, this was only a pretext, and formal. Just experienced Pskov foresaw the undecidability of the task and wisely refused the solution. And then in 1475 for solving engineering problems was invited Fioravanti. "Activity of Aristotle in Italy is an activity, not an architect (perhaps with some exceptions), and engineers, with an outstanding engineer who carried out a series of bold technical solutions, far ahead of practice at that time. As the renowned engineer, he was invited to many of the city to solve the most difficult tasks - Venice, Florence, Mantua, Rome, Naples (SS pod'yapol'skii)292. Strictly speaking, the technique Fioravanti is not white stone, and mixed: the most critical structural elements made of brick293. 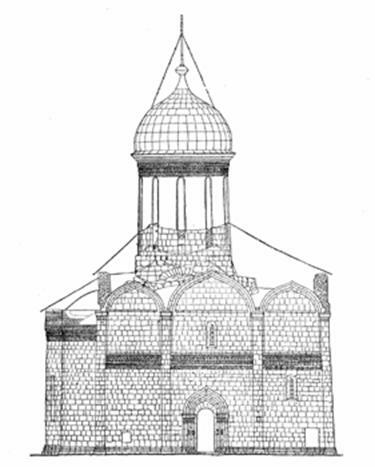 And yet, despite unprecedented measures to strengthen the temple, "in 1624 threatening drop in the vaults of the Cathedral were taken before a single brick" and the newly composed taking into account formed in the upper tier of deformations on the changed picture ("vsparushennoy" configuration), with the reinforcement of their connected with iron, and with the introduction of additional arches" (Kavelmaher)294. It is anticipated the question: reliability of the pre-Mongolian white stone churches, not exceeding a size limit"was also not very high, and to have survived without substantial changes only Transfiguration Cathedral in Pereslavl, the Church of the Intercession on the Nerl and the Dmitrievsky Cathedral. Maybe Suzdal wizard could not build a good, even a small temples? In paragraph 11 of the main 3 stated that they built efficiently and reliably, but can you call this construction quality and reliable? - Polsky, St. George's Cathedral 1230-1234 years: collapsed in the early to mid XV century. Two relatively "safe" temple of the Spaso-Preobrazhensky Cathedral in Pereslavl and the Church of the Intercession on the Nerl - in XV-XVIII centuries had suffered many "capital repairs"295. What's the matter? Blame it Suzdal builders that have survived such a small part of the pre-Mongol white stone buildings? As we saw in paragraph 5 of the main 3, it is not in the main building material is white stone. In the qualitative sorting it reliable enough - certainly not compared with bricks, with limestone, used to build a much more durable cathedrals in Western Europe. Case and not the solution - in the Vladimir-Suzdal churches used hardest lime (80% lime binder, much more than in Kiev296) with a variety of strengthening impurities297. Case and not in the basement: the depth throughout Russia ranged from 0.5 to 4 mbut in any case brought to the mainland soil, bypassing the fertile soil layer. For example, in St. Sophia's foundations have the depth 1.1 mand in the Holy Transfiguration Cathedral of Pereslavl - more than 2 m298. And fill in the floodplain of the river Nerl Foundation special - with additional basement319 (Fig. 21). Moreover, only in Suzdal and Galicia foundations did more walls300. Fig. 21. The Foundation of the Church of the Intercession on the Nerl. The case and not the quality of construction: fitting white stone blocks were made no worse and often better than in Europe301. We can select only one possible cause for the low durability of the temples, which indirectly can be attributed to errors builders - heavy drumsthat are in the plan's cross created a significant burden on the pillars with supporting arches and led to the spreading out the walls in the horizontal plane (see Fig. 16-18). However, it is unlikely there was the fault of the builders. In paragraph 1 of the main 3 we talked about the fact that "towering" temples Dolgorukiy and his descendants was an attempt to play the "European aspirations of building up. Therefore, the only risky architectural solution in the pre-Mongol white stone churches, not exceeding a limit of reliability", - heavy drums, which made the temples "towering" - should be attributed to the specifics of the princely order. But here we are faced with yet another interesting question. As is known, in Byzantium main purpose of the drum was the coverage of the temple daylight. Initially (in the early middle ages) drum and appeared as a Supplement to the dome, as the latter was impossible to do open. And even when the actual degeneracy of cross-schema, when the "sacred" the role of the dome (as in Sophia of Constantinople) was reduced to the performance of tradition (as in Constantinople Merelaine302 or Soluneia (Thessalonika) Panagia303), drum did not lose its main purpose is to skip to the temple more light. In Kiev304 and Chernigov305 Windows relatively large, and not only drums, but in the walls. A Dolgorukiy made Windows and loopholes in the walls, and drums. In the end, in the temples of George, we see a mere formality not only dome (in paragraph 1 of the main 3 we said that to see it you have to stand directly under it), but the role of the luminous drum. But the narrow Windows not only let in a little light. They significantly aggravate the drum and, consequently, increase the load on the structural elements of the quadrangle. E.E. Golubinsky explained Windows-loopholes climatic conditions in the temples was not furnaces and in winter it was too cold306. It is difficult to accept. First, the window embrasures were in the Caucasus307, and in Serbia308, where much warmer. Secondly, the Windows were windowsill with glasses309. Kavelmaher voiced version that narrow window served as protection from thieves310. If it were just about the Windows in the walls, this version would be theoretically acceptable (although if you want to expand or scrap of white stone ax narrow window opening slightly harder than oak windowsill hack). But we are talking primarily about the window openings drums, where the thieves in any case it was impossible to climb. It is more likely that Dolgoruky reduced window for two reasons. First - all the same craving for romanik. Many churches in Europe XI-XII centuries just such a window is more like loopholes311only more often due not to reduce the width and height gain. In any case, creates the effect of "the Lancet", i.e. the aspiration of the building up, which prompted George to pull and weight drums. And to make the drum a greater number of Windows is not possible to design - white stone piers were to keep a hard white stone dome. The same applies to the Windows in the walls - Russian masters have not yet mastered the methods unloading walls, typical of the Gothic. Remarkable fact: when in the Palace Church hierarchy at the end of the XVII century, broke choirs were broadened and the narrow Windows, she soon fell312. But it is very likely that there's a second reason: the potential need to use the temples as defensive structures. Something like "the main tower of the castle. In our time, when most researchers sought to highlight the liturgical function of temples, this version may seem like a relic of Soviet times. But as you know, in the understanding of medieval Church service to God could take and it "militant" form (from the Crusades to participate in the battle of Kulikovo monks Peresvet and osljabja). Let's not forget about the function of many fortified monasteries of the XV-XVII centuries. - the reason for the construction of churches in Dolgoruky close to the walls314. What in Pereslavl found no remnants of transition from the Cathedral to zaborau315that is not what it says - the transition could take the form of a light bridge, at the siege to be destroyed. Of course, no serious assault, no Church could not resist. In the end, precipitating easy to take a battering RAM and knock the door. But the basics of martial arts suggests that the construction of the fortress must not neglect any opportunity to strengthen. First, it is theoretically possible that hold a few extra hours - then wait for reinforcements. Secondly, even a weak citadel able to give Duke enough protection during the uprising of the urban population. Third, the presence of the fortress at least a symbolic citadel need for diplomatic reasons. During the capture of the city walls enemy, naturally, the head of defense is impossible to negotiate with rushing crowds of enemy soldiers, so he shut himself up in the citadel and until the enemy is preparing for its assault has time to negotiate an honorable surrender. And since no other strongholds in the fortresses Dolgoruky was not, the resistance in the temples Yuri was obliged to provide. Moreover, it is likely that under the dome of each temple were built (or were held during the siege), wooden platforms for archers, which could climb the ladder. 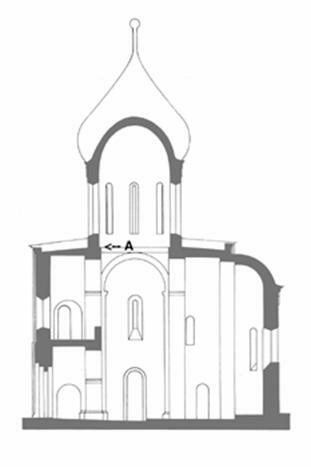 Anyway, in the Holy Transfiguration Cathedral of Pereslavl, as in many other Russian churches XI-XV centuries, under the dome there is a rectangular ledge on which these sites could be based (Fig. 22). Fig. 22. The section of the Transfiguration Cathedral of Pereslavl. The letter "a" denotes the rectangular ledge under the dome, which can build wooden platforms for archers. A shot from the top zakomaras practically do not interfere. For example, the author of this book was measured, in the Holy Transfiguration Cathedral of Pereslavl "dead zone" in a hypothetical shooting from the Windows of the drum is just 15 m. Russian archers were hardly significantly worse English, and about the last known that their arrows pierced armor at a distance of 300 steps, i.e. about 200 m316. In favor of this version and the location of the temples in the most remote place of the fortress by the river. Palaces of the Prince and the chamber of governors were too close, and, seeing the hopelessness of the situation, leaders and their families had a chance to escape in boats. The river could come help, and bring up provisions. At least in the summer. And not in vain in 1237 the Mongols came to Suzdal in winter they should consider freezing, first, impassable swamps, and secondly, the rivers, on which the Russians could and quickly transfer troops to evacuate the military leadership. But peretiranie drums alone do not explain the relatively short life of the pre-Mongolian white stone churches, not exceeding a limit of reliability. Still, the building stood long enough - and 600, and 700 years, and the Cathedral in Pereslavl with a very heavy drum came to our days. Design errors, if it was only in them, would have to occur much earlier. And the problem of heavy drums builders certainly understood by introducing wooden communications and reinforcing walls, arches and pillars (compare plans Suzdal churches (Fig. 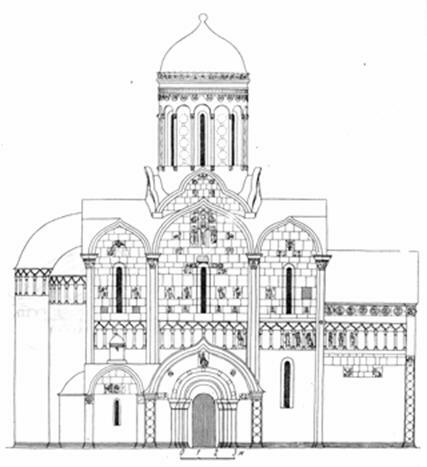 5), for example, with the plan of the Cathedral of the Athonite monastery of chilandar317, is shown in Fig. 23). Fig. 23. Athos. 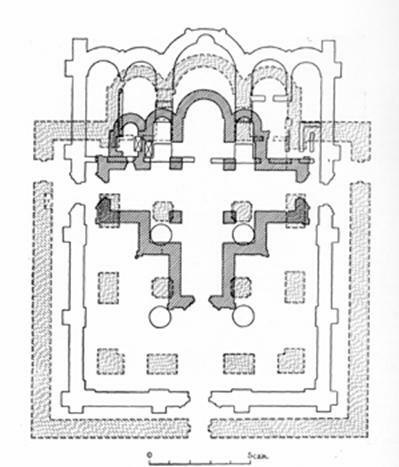 The plan of the Cathedral of the Hilandar monastery (XIII - XIV century). Therefore, it's not just the reels. On the durability of buildings, built in European technology, could affect non-European soil - but, as we saw in paragraph 5 of the main 3, the difference in the soils of Russia and much of Europe with the construction point of view, unprincipled, besides builders always take into account the peculiarities of the soil when laying a Foundation. And the structure of the Vladimir-Suzdal buildings, not exceeding the maximum security", were so strong, that was kept as a monolith, even landslides, soil under them318. What else is in the nature of Russia differ from Europe, more precisely, from the Central regions of the "Holy Roman Empire - southern Germany and Northern Italy? The stones were placed facing in the European technology - almost dry319. So, to completely prevent the infiltration of moisture from the outer surface of the walls under the veneer was impossible. Then came the Mongols in Russia, - however, without the Mongols of the building for several decades, there were no repair. The roof the roof is unreliable and difficult to operate, there appeared a leak, and the water fell under facing not only from the side but from above. In southern Europe it would not be a serious problem, since one or two small frost during the winter (3-5 degrees below zero) can not lead to catastrophic thawing of a laying. In Russia, however, when severe frosts several times during winter thaws are replaced, this leads to a loosening of stones. And as for the cellular structure of white stone water penetrates into the blocks, themselves, cracks appear in them320. AV century spoke about the problem of stratification of a laying, namely, that the rubble layer and two facing (external and internal) are loading their own, which leads to the tendency of "swelling" of facing and falling stones321. If we consider the last statement in isolation from the Russian climate, it's not really fair: Suzdal masters foresaw the problem of stratification of a laying and successfully solved it, putting facing stones unworked a face inside that provided excellent coupling with the wall filling. Coupling was provided and different lengths of stones that different inquiries into the middle rubble layer322. But as soon as we begin to analyse the behaviour of the half-rubble masonry in the Russian climate, it turns out that the water that falls into the cracks of the roof and walls, penetrates between facing and backing and in the frost "removes" the one from the other. In addition, the moisture in the wall "sucked" and below. Percolate leads to fast rotting wooden ties, which, in turn, exacerbates the problem of spreading the walls with heavy drums (Fig. 18). In the Vladimir-Suzdal region furnaces in the temples was not323 and they could only dry the moisture that falls in the cracks codes. But with a good roof last is not a serious problem, and the outer lining of the furnace can't help. In principle, the higher moisture resistance temples could be achieved with the help of their coating. AI Skvortsov rightly pointed out that in the pre-Mongolian time often were plastered vaults324 and fragments of walls, intended under frescoes325. But with the assumption Ahistorical326 that while whitewashing, and some murals, was "routine", one cannot agree: then lost the sense of self and the white-stone building, as we saw in paragraph 9 1 main, much cheaper and technologically it would be built of brick, and then plastering, paint or whitewash. It is much more likely that paint was still fragmented, and whitewashing the walls without plastering) began already in the post-Mongol period, and it is intended not to moisture protection temples, and "cosmetic repair". A whitewash is much worse protects the walls from moisture, than plaster. We see the "logical spiral": if built of brick, the building would be moisture resistant and therefore more durable. Brick, plastered, thereby achieving even greater moisture resistance. And in the case of white stone, this spiral is untwisted in the opposite direction: it is sensitive to moisture white-stone laying still and not covered with plaster. MA Il'in, stating the fact that at the end of the XV century white stone as a building material has been replaced by brick, it was specified that the stone is sometimes preferred for masonry walls and vaults of the basement because of better resistance to moisture327. Indeed, at zero temperature white stone - limestone, "obliged" to lie in the ground - much more resistant to moisture than brick. But the white-stone masonry churches Dolgorukiy and his descendants, as we have just seen, in the Russian climate is much less moisture resistance than brick. In defense of the Yuri Dolgoruky, who began to build a "European", except to say that anticipate this behavior is the half-rubble masonry in Russian conditions hardly anyone was capable of. If Russia and had experience with a white stone, it was in Galicia, where the climate is quite European. Most likely, we cannot speak about any stable features of the influence of climate on the Vladimir-Suzdal white stone temples, depending on their size, architectural forms or location. There is only one relationship, not a new one: the better the care of the temple, so it is durable. And in the Russian climate good care of white stone buildings was particularly important, but it was not and could not be in the conditions and the Mongol invasion, and years of time of Dmitry semaki, and the time of Troubles, and centuries-old Russian mismanagement. Much depended on the "force majeure"-fires and hurricanes, and the "subjective factors" - unsustainable superiors or churchwardens, at the time not noticing leak roof. And so it happened that some churches have deteriorated and were dismantled (or even hit) through 500-700 years after the construction, while others survived. The exception was a small Church of Michael the Archangel in Nizhny Novgorod, for only 150 years. But this temple was the only case in the Vladimir-Suzdal architecture, when the foundations were not brought to the mainland soil and were only covering loam. N.N. Voronin believed that this was the cause of brief "life" Church329. It is difficult not to agree, since the first "model" the Cathedral was the Savior, and the second temple city of Nizhny Novgorod, in the far outskirts of Suzdal land, away from the Prince's eyes, the builders could "save". But there was one exception: the St. George's Cathedral in Yuryev-Polsky, who along with the Trinity chapel "razvalilis all to the ground"330 after a very short historical period - approximately 200 years after it was built, in the early to mid XV century. Approximately then collapsed Nativity Cathedral in Suzdal, but there is more or less clear - it exceeded a limit of reliability". As for the St George's Cathedral, this situation looks strange, and it should consider more. We will not discuss here the reconstruction of the original forms of the St George Cathedral, which is engaged and N.N. Voronin (Fig. 24), and H. Wagner (Fig. 25), and AV century (Fig. 26). Kavelmaher noted several shortcomings in the work of all these researchers, in terms of reproduction of architectural forms preferred reconstruction AV Stoletov331. Fig. 24. St. George's Cathedral. Reconstruction Voronin. Fig. 25. St. George's Cathedral. Reconstruction Of Wagner. Fig. 26. St. George's Cathedral. Reconstruction AV Stoletov. But to investigate the causes of fragility of the Cathedral importantly, and in the reconstruction of AV Stoletov we can see if not stepped arches and tower" Voronin and Wagner, it is still very heavy drum. So, in any case, the load on the structural elements of the quadrangle of the St George Cathedral has been increased. However, we see and like buttresses - high arches, capable, if not completely extinguish raspor walls, to ameliorate the situation. In Pereslavl, where the drum was hardly much better, chapels were not there. And, given their increased the side of the omphalos in the Holy Transfiguration Cathedral 5,1 m (against 4.6 m in the St George), we can conclude that the ratio of the thickness of the walls and pillars, the height of the arches, diameter and size of the drum and other structural parameters of these temples are quite comparable. Consequently, the fall of the St George Cathedral was unlikely to be caused only by a heavy drum. But there was another factor that can play a role in the historical fate of the Church - that local Prince Svyatoslav "be master of himself"332. N.N. Voronin challenged the validity of the message of the chronicler, referring to the fact that the originator of the Tver arch could visit St. George's, where his eye had caught the modern Cathedral of the inscription on the wall of the temple, reporting on the targets set by Svetoslav some "cross", and from this the chronicler made wrong conclusions333. Kavelmaher, proving that the inscription on the act of Svyatoslav in ancient times was in the Trinity chapel, in parallel substantiated and that the chronicler couldn so grossly mistaken and had other data about the authorship of Svyatoslav against George's Cathedral334. This VV kavelmaherom it was concluded that "the architect, who elevated the building, the artist-bearer of ornaments and organizer of the farm was a churchwarden of the Cathedral, the son of Vsevolod the Big Nest, Yuryev Prince Svyatoslav"335. In principle, one of these "titles" - architect, artist or organizer - alone would be enough for the chronicler could rightly say Svyatoslav: "be the master himself. But in favor of the version that the architect was the Prince himself (i.e. Amateur) said the fact that St. George's Cathedral for only about two hundred years. Apparently, we are dealing with the same problem, which is already considered in connection with the invitation by the architect Andrei Bogolyubsky of Frederick Barbarossa: if the Imperial architect built the Assumption Cathedral in Vladimir and Rostov, and you attempt to exceed the "maximum security", valid for Russian artists, he created quite unreliable design. And in respect of Svyatoslav as an architect, we can say: the Prince, raising the Cathedral of St. George was unable to provide the necessary reliability of the temple even if it "acceptable" size. Perhaps, Svyatoslav, overestimating their abilities, refused the services of professional architects and made some mistakes in construction and masonry walls, vaults or arches - we can only guess. Thus, there are already two factors that, taken together, could significantly reduce the "life" even potentially robust design of the St George Cathedral: heavy drums and non-professional architect. And yet, as we shall see, what happened to the temple in the early to mid XV century, can hardly be called a disaster. K. Romanov believed that it was a disaster, similar to the fall of the Suzdal Cathedral - hit the head and vaults, pulling him part of the walls. This view was supported by N.N. Voronin356, and H. Wagner337, claiming that VD Yermolin "extremely carefully treated to restore the ruins of ancient buildings"338. Kavelmaher adheres to this about a completely different position, believing that it could collapse only the head, possibly, not entirely. The evidence of survivors in the interior of white stone reliefs339. But then the Cathedral stood without a dome for many years, facing deteriorated from sprouted trees and the Russian climate, and this, according to Kavelmahera, gave Ermolino formal right to disassemble the top of the Cathedral and collect it again. Unlike Ermolin - Saviour of the sculptural decoration, which gathered the Church from the wreckage (interpretation Voronin and Wagner), Yermolin in the interpretation Kavelmahera appears a kind of barbarian, not doujinshis at dismantling fix the initial position of the stones and the right to reproduce it. The truth probably lies somewhere between these two polar points of view. We will present our own vision of the situation: as correctly observed Kavelmaher, initially, in whole or in part, fell only the head, and the Cathedral stood in this way for many years. Water gets under the cladding, and the corrosive influence of climate on the white-stone building quickly bore fruit: collapsed exterior cladding is on the scale mentioned Voronin and H. Wagner. This gave the chronicler right to assert that the Cathedral and the chapel "razvalilis all to the ground"340. Therefore unlikely VD Yermolin not understand the value of sculptural decoration, groundless examining some of wall-to-columnar zone, and some - to the cap341. But Kavelmaher absolutely right in saying that the crash of St George's Cathedral to say is not entirely justified. Therefore, we can say with reasonable certainty: all pre-Mongolian churches, not exceeding a size limit"is defined in the time Dolgoruky has high structural reliability, and if dropped, then only under the devastating impact of climate multiplied by traditional Russian mismanagement. And St. George's Cathedral was no exception, but its destruction was accelerated very heavy drum and unprofessional architect. - Moscow, the Cathedral of the Andronikov monastery: the top hit in the fire of 1812. Immediately attracts attention soon - within 100-200 years - the destruction of the majority of post-Mongol white stone churches, built in the fourteenth and early fifteenth century within the city walls of Moscow. But the size of these buildings do not exceed the "maximum security" and, therefore, implies a much longer life. N.N. Voronin rightly pointed out that even with the "pre-revolutionary times" there is a stereotypical view of the history of the architecture of this time as a time of deep depression and regression caused by the Mongol defeat346. But, clearly proving the illegality of such a stereotype, it was proposed as an alternate version of "growing pains"347in fact recognized the same decline of architecture, only "progressive". Kavelmaher, Dating Kolomna Church on the site of ancient Settlement" the first half of the XIV century, said her rudeness of the white-stone laying and also makes the conclusion about a certain decline of architecture348. But now we're not talking about aesthetics, but about the structural soundness of the temples. Rudeness masonry and unreliability design is not the same, because churches in the villages of Gorodnya and Kamenskoye (and in some cases even "Gorodische" the Church in Kolomna) finally reached our days. And we may assume that the reliability of the first post-Mongol temples built during Yuri and Ivan Danilovich, was at least not lower than the first temple Dolgoruky. After all, Moscow masters not mastered the new construction equipment and did not attempt to exceed the already known "maximum security". A building skills, as noted Voronin, passed from generation to generation, the benefit of building and repair of churches in Vladimir, Tver and Moscow lands practically did not stop349. But in parallel in research Voronin traced and other position that affect its variants of reconstruction of the last pre-Mongolian and the first post-Mongolian churches: he gave unpreserved temples stepped arches and Gothic tower-shaped top, making the conclusion that low constructive reliability of such endings caused rapid destruction of the temples350. In fact, by Voronin we also see an attempt to define "maximum security", which consists not only in the back and side of the omphalos, and in supporting archs: NN Voronin, emergency disaster had expected, those temples where arches were elevated (hence, the top - "towering"). Accordingly, step arch and "Gothic" top assumed in the first assumption Cathedral of Moscow351, The Nativity Cathedral in Suzdal and the assumption Cathedral in Rostov beginning of the XIII century, and in brick churches of Yaroslavl352. 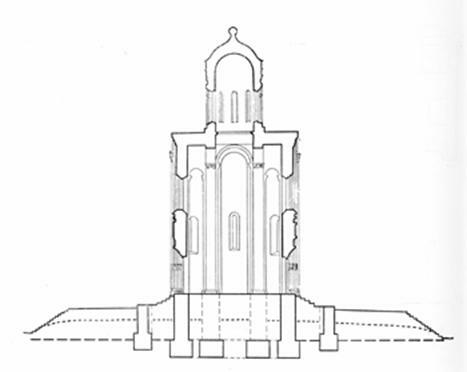 About reconstruction of NN Voronin on the same model of St. George's Cathedral in Yuryev-Polsky we have already mentioned in paragraph 10 of this Chapter. In principle, the reconstruction of temples in the "Gothic" style consistent with the trends of convergence with Europe, Russia, and this confirms the possibility of a stepped arches - if not in the pre-Mongol, the post-Mongol period. But against the allegations of lack of reliability of these structures have a number of arguments. First, enable brick churches of Yaroslavl in historical destinies of white stone building and do on this basis, any General conclusions about their appearance seems to be inappropriate due to the huge differences in the design features of brick and white stone. Secondly, as we have seen, is preferred reconstruction of the St George Cathedral on AV Stoletov supporting arches at the level sets aisles353. Third, the first Rostov Cathedral of Andrei Bogolyubsky, who had neither high arches, or "towering" top (but exceeding a limit of reliability), fell even faster Cathedral of the beginning of the XIII century, standing not even 178 years, and 42 years. Fourth, the Cathedral of the Andronikov monastery, which had higher arches (see Fig. 9), but not exceeding a limit of reliability, some masters Dolgoruky, stood for a long time (about four years), and collapsed due to "force majeure" - the fire of 1812. Fifth, the vaults of aisles in the case of high arches are loaded not only from the side (as in the "classic" scheme shown in Fig. 16), but from above. Therefore, stepped arches gives a more even distribution of load on the drum at the quadrangular elements (and, consequently, their increased structural strength)than the "classic" scheme - with supporting arches at the level sets aisles. So, if the assumption Voronin about the "towering" completion of some of the temples of XIV-XV centuries, and true, then this conclusion did not significantly influence their reliability and durability. Thus, the presence or absence of high arches and "Gothic" top did not clarify the question of why the historical fate of the first Moscow churches was so short. We have already seen that case and not in the poor quality of construction. Case and not in the lack of proper care for the Church - pre-Mongolian churches, not exceeding the maximum security", stood for much longer, despite years of neglect under the Mongol-Tatar yoke. Apparently, the first Moscow churches destroyed what they were erected in the centre of the future capital of a unified Russian state and quickly stopped "to meet the objectives of the" growing city and the growing great power. Naturally, any idea about the monuments of architecture in the XV-XVI centuries were not available, and as soon as the financial possibilities of the temples, under the pretext of "disrepair" demolished and in their place to build something more "prestigious". As is known, the concept of "decay" is very loose. Moreover, sometimes the "decay" is achieved by artificial means, first in many years there is a deliberate savings on the repair, and then requesting funds for a complete rebuilding of the temple, in fact, deteriorated. Major construction has always been an inexhaustible source of unjust enrichment. Perhaps, the only true catastrophe can be considered the drop top with the Church of the Nativity of the virgin in 1479354 and then there is a suspicion that the Church is simply not repaired properly after the "accident" 1454 and 1473 years and brought before the fall. And all the other "short-lived" white stone temples of Moscow XIV and XV centuries (the assumption, Archangel's and Annunciation cathedrals, the Church of the ascension monastery, the Church of our Saviour on the Bor, Church-belfry of St John Climacus)likely to suffer the fate of "artificial ageing". On the outskirts of Moscow temples were less likely to be victims of ambition of the secular and ecclesiastical authorities, and stood for a long time. The Cathedral of the Epiphany monastery for "Mart" stood for almost 400 years and died in a fire, and the Cathedral of the Andronikov monastery albeit with a loss, but reached our days. Conclusions on "special Metropolitan conditions" are confirmed by the fact that the fate of the provincial post-Mongol white stone churches is no different from the fate of the pre-Mongolian, after the rise of Moscow, too caught up in the province. The difference in their historical destiny (stand 300, 400, 500 years or longer) played a role only "force majeure" (fires and hurricanes) and "subjective factors" in the form of negligent churchwardens. For example, in Mozhaisk XV century temples stood up to the XIX century, and in Zvenigorod, they stand still. Everything said about the "maximum security" confirms the conclusion that we made in paragraph 11 chief 3: Suzdal masters in the middle of the XII century efficiently and reliably fulfilled "terms of reference" Yuri Dolgoruky (construction in the European white-engineering with a minimum of neat solution and masonry) and laid the basis for high-quality and reliable construction in this same technique for another three hundred years. The relatively low durability of the temples built and they and their descendants were not their fault. We still have one question that is associated with white stone building: why, despite its high cost and low-tech, it has survived in Russia for so long? Moreover, in the post-Mongolian time a white stone not only not surrendered its positions, but also strengthened them: since the beginning of the XIV until mid XV century, not a single Church in the Moscow Principality was built of brick. Hardly the princes of Moscow Yuri and Ivan Danilovich, as well as their descendants were so "unfettered in the media, so they didn't care from which to build. Let in Moscow white stone had to carry not the 500, and for 50 km but still it is several times more expensive than brick. In paragraph 7 of the main 1, we have seen that even in the hypothetical case of finding the building near the quarry stone was expensive brick almost doubled. A striking example is the construction of the first half of the XIV century "Gorodische" Church (and possibly the Dormition Cathedral in Kolomna355, which in 1307 was annexed to the Grand Duchy of Moscow356. Probably, these temples are built yet Yuri Danilovich357. At this time in Moscow itself has not been a single major temple, and all the resources seem to have been thrown to "approve" the first major conquered the city. Means of Yuri Danilovich was catastrophically low, and are unlikely to have increased in the first year of the reign of Ivan Kalita, when in Moscow, the first assumption Cathedral began to be built not of brick and white stone. The technical transition to a brick no difficulties have been presented. Let not the real brick Italian technology, "brought" Fioravanti380but at least "good old" plinthite. What is of white stone with Dmitry Donskoy in 1367 were built walls of the Kremlin, has its own reasons, is fundamentally different from the motivation of white stone temples that time. As is known, the construction of walls is always done as quickly as possible, because at that time the city unarmed in front of potential adversaries. But that potential adversaries (in this case - the Horde and Lithuania) strong and dangerous, says the fact the decision to build new capacity. So, just don't have time to learn the technology of production of bricks and built a long-proven and practically inexhaustible myachkovsky quarries, regardless of one's means. But the construction of churches could "put off" at least several months required for the development of brick technology. Why Moscow princes did not stop (or at least not "pushed"), the white-stone building? Is it difficult to build several furnaces for firing bricks? Apparently, there were two reasons. Let's start with the first - political: in the Tatar yoke of white stone churches were to be an element of the state ideology, to abandon all of which meant "lose face" to Europe. And so, being "ulus" Horde, Russia ceased to be considered European courts as an equal partner359. Byzantium at that time did not constitute any meaningful power in the political arena (for example, in 1371 Emperor John Paleologos, was arrested in France for non-payment of personal debts Venetian merchants360). Therefore, all hope of returning Russia to the "civilized world community" have been associated only with Europe. The second reason is, paradoxically, economic, referring not only to civilized forms of the economy, and to what nowadays is called "lobbying". The thing is that too many influential people, one way or another were connected with the process of breaking, handling and delivery of white stone, and for them the transition to cheaper and technological brick meant depriving a large part of income. One can imagine, for example, and what funds dispensed to the Prince of the army Teamsters, and the fact that the considerable part of these funds ended up in the pockets of "intermediaries". Most likely, these same two reasons happened and fairly rapid transition to a brick at the end of the reign of Basil II and the reign of Ivan III. First - the same political: in Europe at that time began to build brick everywhere, it was already time Brunelleschi (1377-1446) and Bramante (1444-1514)361. The second - the same economic, but with the opposite sign": Basil II and Ivan III, strengthening autocracy, and fought with excessive corporate autonomy, and with "waste of public money"362. Consequently, the influential advocates of white stone technology, have lost the opportunity to refer to the European experience, could not have success. They were only references to "tradition", but public concerns have outweighed. Capital construction has acquired a mass character, and the use of white stone became too heavy a burden for the Treasury. Apparently, the "Swan song" of the political influence of the defenders of the white stone was the assumption Cathedral, the walls of which even Fioravanti was forced to build a "traditional" manner. But it was already the end - at least in the capital of white-stone architecture has become a rare phenomenon. In principle, this could complete the book, we examined the motivation and the creators and followers, and "gravediggers" building of white stone. But we have stayed pending another essential element of the white-stone architecture - the sculptural decoration of churches. It also contains trends of the era before us, and they need to stay by themselves.